There is an upcoming event that EVERYONE who reads this blog should know about. The event? AutomataCon. That's right...a convention for us! The press release below says it all. I will be there. I hope you will too! AutomataCon is a newly conceived convention of and for artists, collectors, historians, and enthusiasts of automatons and related kinetic art. 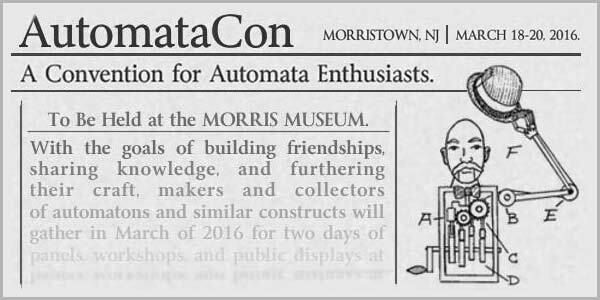 It is a three day event being held March 18th – 20th, 2016 at and in conjunction with the Morris Museum in Morristown, New Jersey, home of the Murtogh D. Guinness Collection of Mechanical Musical Instruments and Automata. The goal of the convention is to gather people from around the world to share ideas, build relationships, and grow interest in automata new and old. As can be seen from our ever-growing Attendee Gallery, beginners as well as some of the premier artists, collectors, historians, and authors in the automaton community from around the world plan to be in attendance. The convention will include a variety of private and public programming, including: social gatherings, museum tours, panel discussions, live demonstrations, workshops, presentations, and an exhibition. There will also be a premier showing of the extremely rare 1928 film, Le Monde des Automates, in the museum’s Bickford Theatre. Originally created as a typical period silent film using hand-driven cameras, an accompanying sound track was added shortly thereafter, making this one of the first Swiss-made sound films. About 25-30 minutes in length, it was intended to accompany Alfred Chapuis & Eduard Gélis’ foundational 2 volume book by the same title, and documents some extremely rare automata plus a truly unique mechanical musical instrument, the Violinista by Boreau & Aubry (1918-22), in action. A fabulous historical document! The idea for a convention stemmed from the fellowship shown on the Automata / Automaton Group and Mechanical Adventures group on Facebook. The true value of the convention will be the relationships built and knowledge shared when passionate people of common interest come together. As such, the success of the convention will depend on the attendees themselves. In the end, we are optimistic that great things will come. Please join the Facebook event page for the latest news on the convention. Visit the event website for more details and to make your reservations.